On Tuesday, Vanessa and I had the chance to support our friends at The Home Depot Foundation and Habitat For Humanity Toronto. As you probably know, Habitat for Humanity builds affordable housing, helping to break the cycle of poverty for hundreds of families each year. This week, over 300 volunteers from The Home Depot and their supplier community came out to build two fully accessible semi-detached houses in North York. Even more amazing: they build the homes from the ground up in only 10 days. 10 days! I can barely pick a paint colour in ten days! Day 8 - Entrances to the two houses. Looking close to finished on the outside! That's just crazy. And super inspiring. And by tomorrow, Oct. 4th, at 3pm, the keys to these finished homes will be handed over to two very deserving families. As part of the home ownership, the families must volunteer 500 hours of their "sweat equity" to Habitat for Humanity. We heard how members from these two particular families have been on site every day, have been volunteering time at the Habitat Re-Store (a must visit for DIY supplies) and their kids have been earning volunteer hours by getting good grades in school. I am so impressed that these families have taken their destinies into their own hands and sought out a partnership with Habitat for Humanity. From L to R: Erika Botond | The Home Depot Canada, Angela Solomos | Habitat For Humanity Toronto, Vanessa, Paulette Minard | The Home Depot Canada Foundation, Jennifer Hills | The Home Depot Canada, me. 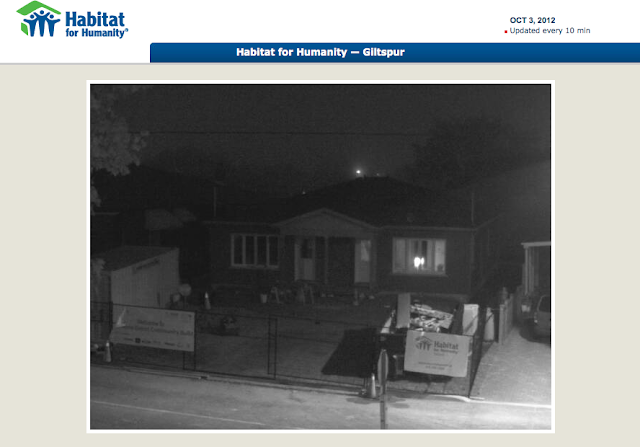 ...someone was inside burning the midnight oil, ensuring this house gets done on time. Disclosure: I have worked with the The Home Depot Canada Foundation previously on Bloggers Give Back and am currently working with The Home Depot Canada on my basement renovation. I have not been compensated for this post. All opinions expressed are my own.